Dhananjay Madhav Sakhalkar – Jarman International K.K. Favorite Thing About Living in Japan: Mutual respect, Politeness, Always focussed towards customer satisfaction and striving towards providing high quality and latest technology output. Favorite Place to Visit in Japan: So many favorites. To name a few: Enoshima, Kamakura and Kyoto. 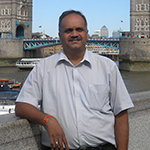 BIO: Dhananjay is from Pune city with interests in banking and technology.